Fanning (L) in March, and Fromme (R) at her 1975 assassination trial. The cast of Quentin Tarantino’s upcoming Once Upon A Time In Hollywood is coming together nicely, with A-list stars lining up seemingly by the dozens to play weirdos—both fictional and real-life—running around Hollywood in the fateful summer of 1969. Yesterday, Deadline reported a whole bunch of names that have been added to the already-overstuffed cast list, including Damian Lewis, Luke Perry, Emile Hirsch, Dakota Fanning, Clifton Collins Jr, Keith Jefferson, and Nicholas Hammond. Several of those—including Perry and Tarantino favorite Jefferson, who’s playing a guy with the delightful name of “Land Pirate Keith”—will be playing fictional characters. The real-life casting is also intriguing, with Homeland star Lewis set to play ‘60s action star Steve McQueen and Hirsch playing Jay Sebring, the hairstylist to the stars who was one of the four people killed in what would become known as the Tate murders. 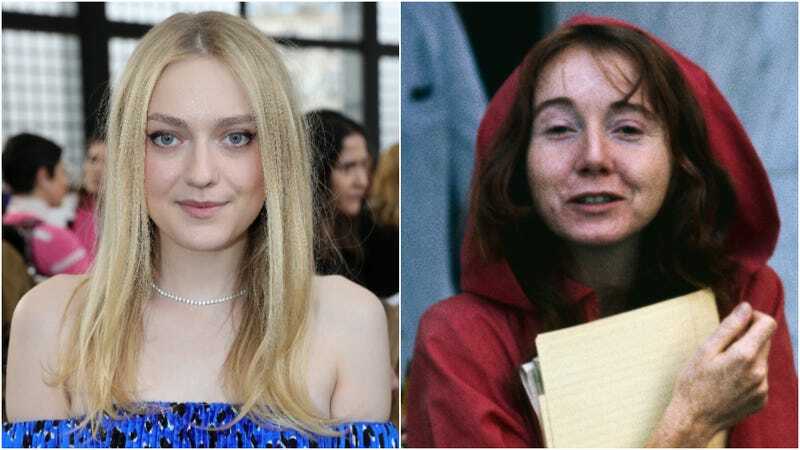 Fanning, meanwhile, will play Lynette “Squeaky” Fromme, a member of the Manson Family who wasn’t involved in the group’s murder spree in August 1969—not enough to be arrested for the crimes, anyway—but who camped out outside the courtroom during Manson’s trial, carving an “X” into her forehead after Manson did the same and preaching Manson’s racist apocalyptic philosophy to any members of the media who would listen. She was imprisoned shortly after for contempt of court for refusing to testify in the trial, and for trying to prevent other Manson family members from testifying. Upon her release, she attempted to assassinate then-President Gerald Ford and was sent back to prison, where she remained until being paroled in 2009. Margot Robbie was previously cast as Manson victim Sharon Tate. Leonardo DiCaprio will play a (fictional) washed-up Western TV star named Rick Dalton in the film, who also happens to be Tate’s next-door neighbor. Other than that, it’s not clear exactly how the Manson murders will factor in to the movie, but we’re sure it will be handled with Tarantino’s signature restraint.